SAB Presents "The Blind Side"
Barbara Price, associate professor of English, and Janice Young, associate professor of health science, recently received the William O’Donnell Lee Advising Award. Provost and Vice President for Academic Affairs Troy Paino presents the Lee Advising Award to Barbara Price (top) and Janice Young (below). 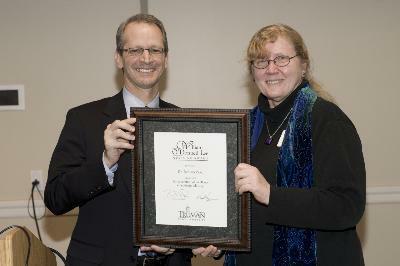 The award was established by Dr. Jeanne Stephens Lee Blackmar in honor of her late husband. Price and Young will each receive a $1,000 development fund to be used for travel to advising conferences or institutes, research materials and other relevant items. 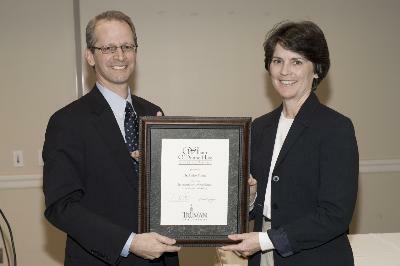 All full-time faculty advisers are eligible for the annual award. Scientist, inventor, comedian and author Bill Nye will perform at Truman April 16. The event will be hosted by the Student Activities Board. Nye will take the stage in Baldwin Auditorium at 7 p.m. The event is free for students, faculty and staff with a Truman ID. General admission tickets are $5. He uses his trademark humor to help viewers gain understanding on big issues, like the environment and sustainability, and presents positive, upbeat solutions to these critical problems. Serving as an ambassador for science education, Nye has traveled across the United States and has served on children’s education, science and television committees, and acted as an advocate for children’s safety and health. Internationally-renowned percussion artist, Benjamin Toth will be visiting Truman March 21-23 for a series of master classes, a concert and applied lessons. Toth is a professor of percussion at The Hartt School at University of Hartford. He will perform in concert at 8 p.m. March 22 in Ophelia Parrish Performance Hall. The concert will feature solo works for a variety of percussion, including steel pan, and Toth will be accompanied by members of the Truman percussion studio. Toth’s appearance is sponsored by the Truman Percussion Society, Yamaha Corporation and Zildjian Cymbals. Admission is free. For a complete schedule, and additional information, contact Michael Bump by e-mail at mbump@truman.edu or by phone at 785.4052. The Blanton Nason Brewer Hall basement will be transformed into the Tunnel of Oppression and open for tours from 7-9 p.m. March 23-25. The Tunnel of Oppression allows participants to fully engage in the experience of several forms of oppression. The event, which first began at Western Illinois University, has been adopted by many other universities nationwide and has been a positive diversity experience for participants who go through the tunnel. The Tunnel of Oppression was hosted at Truman for the first time last year with nearly 350 individuals in attendance, and more than 70 volunteers. This year’s tunnel will include rooms that focus on seven different areas of oppression from past and present American culture. The areas are focused on immigration, poverty, physical disabilities, mental disabilities, religion, racism and sexual orientation. The individuals who attend this event will experience a part of society they may not have otherwise seen or experienced. “Breaking Down the Wall,” a reflection program, has been added to the program to help break down stereotypes that feed oppression. “Breaking Down the Wall” will take place March 31 outside of Blanton Nason Brewer Hall. Sponsors for the Tunnel include: Funds Allotment Council, Blanton Nason Brewer Hall Senate and the Residence Life Diversity Committee. “Breaking Down the Wall” is sponsored by the Multicultural Affairs Center. 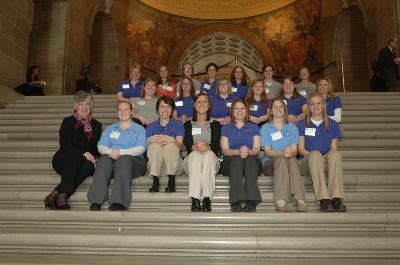 Communication disorders graduate students enjoy the Missouri-Speech-Language-Hearing Association Legislative Day Feb. 16 at the Capitol in Jefferson City. While there, the Truman students were introduced on the house floor by Rep. Rebecca McClanahan. Faculty representatives were Andrea Richards and Melissa Passe. The Truman Chemistry program recently tied for 24th place nationally based on the number of American Chemical Society (ACS)-accredited degrees awarded in the 2007-2008 time frame. The number of accredited degrees awarded by Truman in the 2007-2008 academic year, 29, exceeds all but one of the Ivy League schools. Truman also awarded 14 more accredited degrees than the entire rest of the MIAA conference. The most accredited degrees any other MIAA school awarded was six. Truman also awarded one less than the combined total of all four University of Missouri campuses. Natalie Zemon Davis, author of a forthcoming book by Truman State University Press, won the 2010 Holberg Prize, an annual academic Norwegian prize, for her outstanding scholarly work, and her imaginative approach to history coupled with her intensive archival work. The award is given to scholars in the arts and humanities, social sciences, law and theology, and is worth about $760,000. 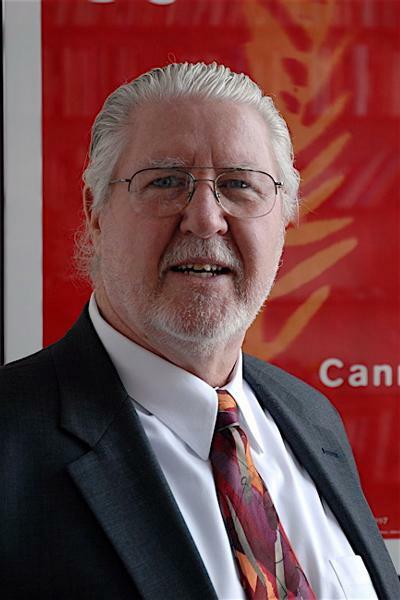 Davis’ book, “A Passion for History,” will be published in May by Truman State University Press in its Early Modern Studies series. It is a conversation with history professor Denis Crouzet about her remarkable career in historical research and writing. First published by the French press Albin Michel, Truman State University Press got the rights to publish the English edition last year. Davis’ classics include “The Return of Martin Guerre,” “Women on the Margins” and “Trickster Travels.” Her published works have been translated into many languages and have added considerably to understanding early modern society and culture. “A Passion for History” may be ordered online at http://tsup.truman.edu or at the Truman Bookstore. The Truman State University Symphony Orchestra, under the direction of Sam McClure, will present the annual Gold Medal Concert at 8 p.m. March 27 in the Ophelia Parrish Performance Hall. This concert is a showcase for student achievement and will feature three students who were prizewinners in the recently completed Gold Medal Competition. Featured students are: Martha Sharff, soprano; Jenny Choo, piano; and Eric Schweizer, alto saxophone. They will perform music by Weber, Shostakovich and Husa. The orchestra will also perform Symphony No. 2 by the Russian composer and chemist Alexander Borodin. The Religion and Film Student-Initiated Learning Opportunity, sponsored by the Provost’s Office and the Department of Philosophy & Religion, will sponsor talks by two noted scholars of religion and film in the coming weeks. 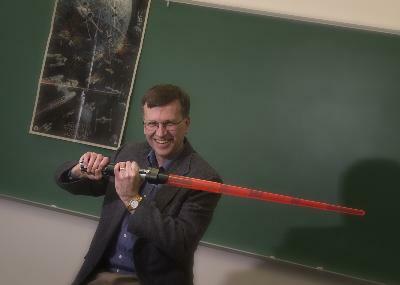 Dr. John Lyden, chair of religion at Dana College in Blair, Neb., and the editor of the Routledge Companion to Religion and Film, will present “Star Wars as Religion: Myths, Morals and Rituals,” at 7:30 p.m. March 24 in the Student Union Building Room A.
Dr. William Blizek, professor of philosophy and religion at the University of Nebraska-Omaha and founding editor of the Journal of Religion and Film, will discuss a collection of short films in “Religion and Film Shorts,” at 11:30 a.m. April 1 in the Student Union Building Alumni Room. Contact Dereck Daschke at ddaschke@truman.edu or Mark Lambert at mml184@truman.edu for further information. The J. R. Popalisky Scholarship Fund of the Missouri Section of the American Water Works Association is offering a $1,000 scholarship is to encourage enrollment in educational studies related to career fields associated with water supply. Applications are available in the Financial Aid Office in McClain Hall 103. Deadline for submission of this application is March 24. The Press Club of Metropolitan St. Louis is inviting eligible media communication, and journalism students to apply for scholarships for the 2010-2011 academic year. Students of journalism or related fields who are residents of the St. Louis metropolitan area (City of St. Louis; Franklin, Jefferson, Lincoln, St. Charles, St. Louis, and Warren counties in Missouri; and Bond, Clinton, Jersey, Madison, Monroe, and St. Clair counties in Illinois) are eligible to receive these scholarships. Applications are available online at http://www.stlpressclub.org/scholarships.html. Deadline for applications is March 30. The Public Relations Office is now accepting resumes for the full-time Fall 2010 internship position. Interns can receive course credit, a stipend and valuable experience in public relations office duties. Interns usually take six hours of class in addition to six hours of internship credit. Applicants should have a strong background in writing and editing. Communication majors are encouraged to apply, with special consideration given to candidates with knowledge of Associated Press style, experience in desktop publishing and familiarity of InDesign or similar software. To apply, send a resume, two writing samples and contact information for two on-campus references to the Public Relations Office, McClain Hall 101, by April 9. For specific questions about the internship, contact Heidi Templeton at heidi@truman.edu. The Career Center is hiring for the in-center and design teams. The in-center team assists student at the Career Center by critiquing resumes and cover letters, assisting with graduate school selections and interview preparations. In-center positions are available for scholarship or work study hours. The design team creates materials for newspaper ads, fliers, large posters, brochures and the Career Center website. Design team positions are available for scholarship, work study or institutional hours. Those interested in either team must attend a hiring session at 5:30 p.m. March 22 or 23. For more information, visit http://career.truman.edu. The Center for Student Involvement is currently hiring scholarship and work study students for the 2010-2011 academic year. Apply online through TruPositions. Interviews for the available positions will take place the first week of April. Students are asked to apply as soon as possible. Upward Bound is seeking residential mentors for summer 2010. Applications reviews will begin immediately and continue until positions are filled. Application packets and information are available at http://ub.truman.edu or call Donna at 785.4244. Need career ideas as an art, theatre or history major? Visit St. Louis, the Missouri History Museum's Race Exhibit and attend the Amelia Earhart play. The cost is $10, which covers transportation, tickets, one meal on Saturday and hotel with complimentary breakfast. Register for this event at http://pdi.truman.edu. Come cheer on the athletes, hang out at Olympic Village between events and work one-on-one with the athletes. Lunch is provided. Grab a friend, put on a smile and sign up to be a buddy for the Spring Special Olympics in Kirksville on April 17. If interested, e-mail Lara at lkl8154@truman.edu. Organizations may register online at http://csi.truman.edu or stop by the CSI Office in the Student Union Building. Organizations that register by April 20 are eligible to win a $25 CSI credit. All applications are due August 25. There is a $1 registration fee to offset costs of the fair. Google is looking very closely at the amount of community support a city’s submission has behind it, so having individual nominations is crucial. Nominate Kirksville by following the directions at http://www.fiber4kirksville.info/how-can-i-help/get-involved. People interested in learning more about the initiative can visit the group on the web at http://www.fiber4kirksville.info/ or join the Facebook group at http://www.facebook.com/pages/Google-Fiber-For-Kirksville/302090707335?ref=search&sid=36105437.1858266783..1&v=wall. Bring in non-perishable food items or donate Dining Dollars, meals or Bonus Bucks. Sodexo will then take the food items to the Kirksville Food Bank for distribution to families in need. Meet the candidates campaigning for Kirksville City Council, Kirksville R-III School Board and the Adair Country Nursing Home Board. The City of Kirksville will also have a table to answer questions about the upcoming waterworks and sewage system bond issue on the April 6 ballot. At 6:30 p.m., each of the five School Board Candidates will be given two minutes to address the audience. That will be followed by the three City Council Candidates addressing questions from a media panel. Each of the City Council candidates will be given an opportunity to provide a short opening and closing statement. Listen live on KTRM 88.7 The Edge at http://ktrm.truman.edu. The library gallery is featuring award winning literature from the library’s collection. Don’t forget to complete the 2010 Census form. Students who live off-campus receive forms in March to be returned in the provided envelope. Students who live on-campus, or in a fraternity house, will receive a form in April or May to be returned to a designated site on campus. Keith Harrison, associate professor of accounting, Alan Davis, associate professor of accounting, and Laurie Turner, assistant professor of accounting, had their article “Practical Guidelines for Establishing or Improving a Volunteer Income Tax Assistance (VITA) Program,” accepted for publication in The CPA Journal. Priya Kambli, associate professor of art, recently won the Photolucida national photo competition. Kambli was selected as one of the 50 top photographers in the country by a juror of international photographers. Of that group, she was selected as one of three photographers to receive a book contract. Her book, “Color Falls Down,” is due out this month. It may be ordered through Photolucida at http://www.wmjasco.com/photolucida/photolucida.html. Deb Kerby, professor of accounting, and Jeff Romine, professor of accounting, had their article “Develop Oral Presentation Skills Through Accounting Curriculum Design and Course-Embedded Assessment,” appear in the Journal of Education for Business. Kelsey Kline, a senior music major, has been invited to present her paper, “Rhythm and Color in Art as Influenced by Jazz,” at the College Music Society’s Regional Conference, March 27-28, at Emporia State University. She is also a finalist for the Paul Revitt Memorial Award for Best Student Paper. Kline’s research mentor is Shirley McKamie, lecturer in music. The paper is from a project completed in JINS 378–Visual Music. Jason Lin, professor of business administration, and Paul Fellows, associate professor of business administration, had their article “Capital Budgeting in Nepal and the U.S.” published in the Journal of the Academy of Finance. Betty L. McLane-Iles, professor of French, attended and participated in the Tucson International Book Festival at the University of Arizona March 13. McLane-Iles, a guest University of Arizona alumni author, gave a reading of extracts from her historical novel “Dieppe Crossing,” centered on the Spanish Civil War and French Resistance. Her husband, Lawrence Iles, an independent historian, participated in the reading and presented historical background information. Todd Phillips, director of the Student Success Center, recently presented in Columbus, Ohio, at the National Association for Developmental Education Conference with colleagues Hunter Boylan, from Appalachian State University and Kathryn Van Wagoner, from Utah Valley University. Phillips is the former National Chair for NADE’s Political Liaison Committee and presented a session entitled “Making the Case for Developmental Education: The Advocacy Project.” The presentation explained how to participate in The Advocacy Project, and was designed to help NADE members and educators become advocates for developmental education on their campuses, in their communities and with policy-makers. Discussion included key messages about developmental education, academic support, and disseminating information regarding both. Wynne Wilbur, associate professor of art, was recently named a national finalist for The Honor Society of Phi Kappa Phi’s Artist Award. This national award recognizes “individuals who demonstrate the ideals of the Society through their activities, achievements and scholarship.” Wilbur is also a past president of the Truman chapter of Phi Kappa Phi. Lin Zhang, assistant professor of business administration, had “Effect of Product Harm Crisis on Brand Performance,” accepted in the International Journal of Market Research. The Truman National Education Association Student Program attended the 2010 Missouri NEA Student Academy Feb. 26-27 in Columbia, Mo. Members attended various workshops for future teachers, met members from other university chapters throughout Missouri, and were inspired by keynote speakers. Melody Jennings, professor of health and exercise science, presented a workshop entitled “Move to Learn and Learn to Move.” Truman’s chapter also took home five state awards including Outstanding Chapter Project, Most Members in Attendance and Membership Increase. Faculty adviser, Beverly Perrachione, assistant professor of elementary education, was awarded Exceptional Adviser, and the Truman chapter was awarded Outstanding Chapter for the third year in a row. The Weekly Lunch Series continues at 12:30 p.m. March 24 in the Student Union Building Spanish Room with the second of three events featuring the annual Academic Integrity series on copyright, plagiarism, FERPA and more. The Weekly Lunch session on March 31 will also feature the Academic Integrity series. Human Resources will sponsor the health and wellness program Eat This, Not That: Healthy Food Substitutions, at 3 p.m. March 24 in Pickler Memorial Library Room 103. Learn how to play the swapping game when it comes to making food decisions. Which one is better for you: Snickers or 100 Grand Bar? Breyers or Haagen Dazs ice cream? Discover the answers to these and other trade-offs at the session. Register online at http://hr.truman.edu/register. The School of Health Sciences and Education will present “Vietnam Nurses with Dana Delaney” at 5 p.m. March 24 in Violette Hall 1000. The DVD screening is offered in conjunction with Kirksville’s Big Read. E-mail rdonahue@truman.edu for more information. The Theatre Department and the School of Arts and Letters will present “Rabbit Hole” at 8 p.m. March 25-27 in the Ophelia Parrish Black Box Theatre. Admission is free. The play focuses on a couple who have everything a family could want, until a life-shattering accident turns their world upside down and leaves the couple perilously apart. “Rabbit Hole” charts their bittersweet search for comfort in the darkest of places and for a path that will lead them back into the light of day. The Society for Sino-American Studies is hosting Asia Fest from 5-8 p.m. March 26 in the Student Union Building Georgian Rooms A and B. Cost is $1 for a plate of food and $1.50 for bubble tea. Enjoy a fun-filled festival showcasing various aspects of Asian culture. There will be booths for games, origami, calligraphy, tea, traditional clothing, language tables, food and more. Phi Sigma Pi and Tau Lambda Sigma will host a free Parent’s Night Out from 7-10 p.m. March 25 in the Spanish Room of the Student Union Building. Parents from the Kirksville community can drop off their children for a night of games and activities. Dinner will not be provided. Contact jcr3482@truman.edu for more information or to RSVP. Pre-registration is not required but is encouraged. Sweet Nothings, Truman’s co-ed a cappella group, will be presenting their fifth annual concert “Whispers in Your Ear,” at 8:30 p.m. March 26 in the Student Union Building Hub. Fellow performers will be True Men, Minor Detail and The Stereotypes from Washington University in St. Louis. Admission is Free. Beta Alpha Psi is sponsoring a volunteer income tax assistance program from 8 a.m.-3 p.m. March 27 in Violette Hall 1424. IRS certified volunteers will be available to help students and members of the community file their income tax returns for free. For more information, call 785.4268 or visit http://bap.truman.edu.